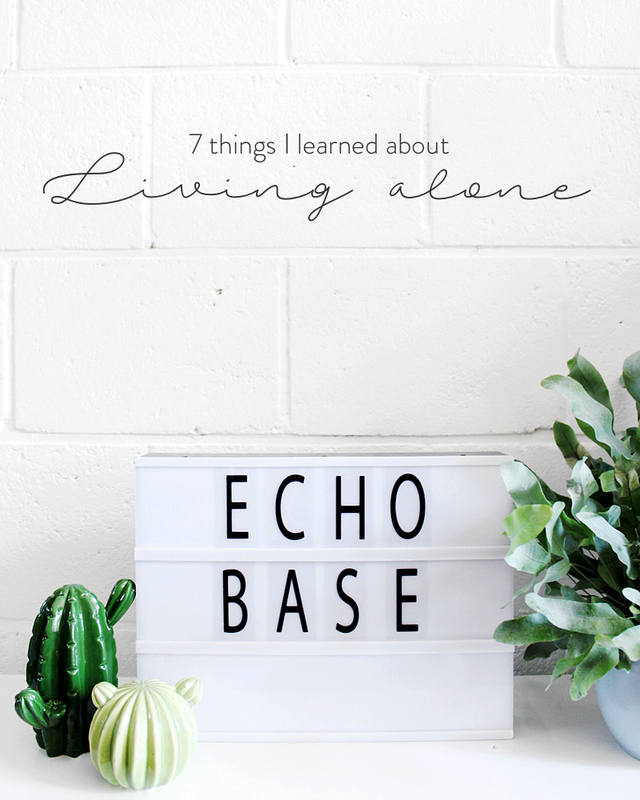 7 Things I Learned About Living Alone. I've been living alone for almost a year and a half now, and there are definitely some things I've learned along the way. From the scarceness of real free time to the notorious happy bubble, I've listed the 7 most important lessons just under the cut. Hope you'll get a good read out of it! I'm pretty sure I've mentioned the whole it's like I'm cleaning all the time thing on here before, but it's just so true and I'm 100% sure I'm not the only one who feels like this. The to-do list is never-ending, the floors don't clean themselves and actually take a bit more than the oh no it's my turn to clean, let's just get it over with a quick once-over treatment I was used to giving when I still lived at home (so sorry, folks), and who knew how quickly milk runs out? In short, real free days are sparse, and you quickly learn to make the most of it whenever one comes around. Although you WILL feel like you're forgetting something important whenever you're finally taking some off time, believe me. 2. you talk to yourself (but it's not enough). Oh, yes. One of the first habits you'll develop is talking to yourself. Not the occasional kind every human being indulges in at some point in their lives, but the daily kind. No biggie, perfectly normal. Have pets? They make for ideal speech intakers as well, but the thing is: it will not be enough. There's nobody talking back, so whenever you do run into other people, go out, have guests over, or - most common in my case - drop by at your parents', there will be no stopping the words coming out of your mouth. Thousands of them will want to come out all at once because you have so much to say and talk about. In this way, I have blurted out funny things I thought about when on my own, crazy stuff that happened at home or at work, but also kind of cropped up things that I don't necessarily mean but came out the wrong way because I was unable to vent about it before. Bit of a ticking speech bomb nowadays, as it were, but I'm working on it. 3. stuff will break and you will freak out about it. And then fix it like a badass. Or call your Dad. That, too. 4. it's easier to create and keep up habits. Healthy or other kinds. When your agenda is the only one you have to keep in mind, the planning becomes so much easier. From eating healthier and whenever you want, to having exclusive control of what's on the TV menu that night; you have no idea how liberating it is to live alone until you do. And I'm not saying I had it that bad over at my parents' because I bet they'd have been pretty open to that sneaky glass of red wine on a weekday, but there is that small, goody-two-shoes part of you that felt like you had to justify and give a convincing reason as to why you'd even want one. And now you don't. You just do whatever the bleep you want. It. Is. Awesome. 5. pets, friends and family are lifesavers. There's absolutely no need to be a wimp about it: you will feel lonely and down and out on several occasions. It's only human. I would even go as far as to say that, yes, that thought about 'oh my god. If I die now no one will know! ', yeah, that's been in my head. When such moments come around, however, you'll notice how much more you treasure those moments with friends and family, and actually enjoy them much more than ever before. And pets? I don't care how cheesy it sounds, but they truly are a constant support and lifeline, even when I don't realise it. There are moments I'm lying on the couch, watching a film and minding my own business and just look down at where Strummer usually lies (aka, in the little spoon position because he's adorable) and then to Leia (somewhere high up and dozing off) and only then realise how important and comforting those little - well, not so little - balls of fluff are. Man, that WAS cheesy. Not really sorry. 6. it takes time to make a home. I used to think that the minute I moved out and dropped and arranged my stuff in my apartment, that that would be it. My new home, boom. Turns out that's definitely not how it goes. Building your home takes time, and that's actually why it's so much fun. Infinite fun, really, as you generally add decoration and memories to it and put your own personal stamp on each room. My apartment now looks totally different to when I first moved in almost a year and a half ago, and I love how you can tell the difference. 7. and then there's that near-inaccessible happy bubble. And the fact that you'll be a whole lot pickier as to who you let into that bubble. Take me for example; I've been single for a couple of years now, made my home alone, and am building a happy life for just me, myself and I that's already up to the point that I'm not really looking for someone to 'make it whole' anymore, but rather someone that'll compliment the life I've already made. That's a pretty difficult thing to say OR be, but there's no point in claiming otherwise. So, no, I'm not saying I'll never find anyone. I'm just saying that he'll have to be something extraordinary because I'm pickier than ever. It is what it is. And it's not just boyfriends. You'll get to know yourself on a whole other level when you live alone. You'll learn what makes you happy, what pisses you off, what ruins your day, etc. Which inevitably will lead to you knowing who your real friends are and who you were just putting up with. Again, I know that sounds harsh but it doesn't necessarily have to be. I still call all of my friends friends and I truly enjoy my time with them, but I do know who I can trust with my life. And that is a small group, let me tell you that. There you go, 7 lessons learned. I wanted to end with something else, though, and that is that you should totally feel entitled to brag when you live alone. I didn't realise this myself until one of those trusting you with my life friends surprised me with a "you know, I'm so proud of you" out of nowhere. I hadn't been living alone for long, was feeling like I didn't know where my life was going (still not really there, ha!) and like I was just struggling through the whole thing when she just came out and said that. I didn't even say all those things out loud but somehow she knew I needed to hear it, and now I want all you live-aloners to hear it as well: you are acing it. You're supporting yourself all on your own, paying your bills on time - or juuuuuust in time -, those pets and plants are alive because of you, you're juggling your day-time job with being a master chef for yourself in the evening, you've found genius ways to make your life easier all on your own. You are a badass. Q: recognise any of these situations/lessons or have some of your own? Let me know in the comments!